SMC4 geo-location tracking enables law enforcement agencies, companies, marketing research organizations and individuals to search publicly posted social media traffic from Twitter. Social media messages are tracked in real time, ensuring that all posts are collected, viewed and achieved before the posts can be deleted. 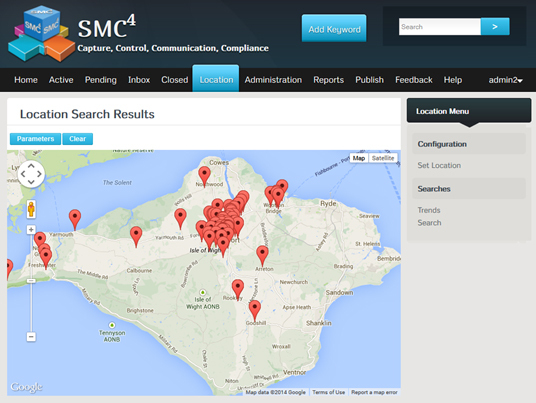 SMC4 geo-location tracking can be customised for specific geographical search areas, by circling the area, isolating and identifying all social media users within the search area, and record dates, times and locations of any message sent from any particular user and from any mobile device. Data collected can be used in finding key witnesses, leads and solving crimes. Social media messages are tracked in real time, ensuring that all posts are collected, viewed and archived before the posts can be deleted. Messages are viewed in a dashboard in order of risk priority and notifications are sent to the administrator for appropriate action to be taken. Archiving these social media messages is critical in creating a chain of custody, and these messages can be used as evidence in court.